The 5th Nordic Retail and Wholesale Conference left Sweden for the first time since it started in 2008 in Norrtälje. This year’s conference took place at Aarhus University in Denmark. 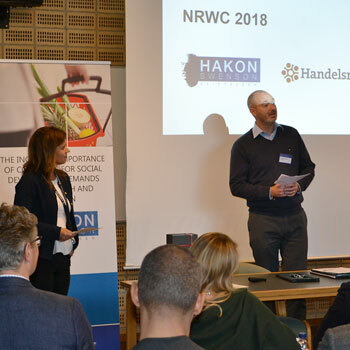 About a 100 researchers in the field of retail and wholesale gathered in Aarhus in November to meet, discuss papers, listen to key note speakers and enjoy a bit of Aarhus at the NRWC 2016. 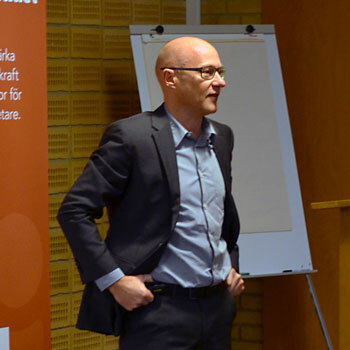 Lars Esbjerg and Birger Botrup Jensen, Department of Management, Aarhus University, were chairs of the conference. At an academic conference like this the wide spectrum of topics and interests in this field really become apparent. Some of the different themes that were discussed were digitalization, smart phones, logistics, economic geography, innovation, pricing, consumer behaviour, management, work and employment, omni-channel, sustainability and atmospherics. The first key note speaker was Kenneth Nielsen, Executive Vice President, E-commerce & Digital, from Dansk Supermarked Group, with previous experience from Apple and Amazon, who talked about the digitalization of a retailer. – In this new and fast changing environment it’s important that we learn continuously and that we allow mistakes so that we are open to try new things, said Kenneth. He also pointed out the importance of personalised marketing and offers; the customers don’t accept the traditional “one-to-many”-approach anymore – they expect and anticipate more relevant marketing. The conference dinner was held at ARroS Art Museum with a guided tour of some of the interesting contemporary art works exhibited in the museum before the dinner with a view of Aarhus by night. 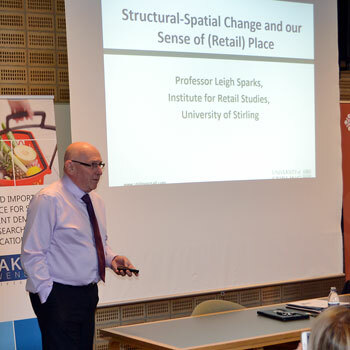 The second key note speaker was the well-known Professor Leigh Sparks, University of Stirling, and he focused on sense of place – specifically retail and the high street crisis. – The problem of place when it comes to city centres in small towns losing their retail to external locations is often categorized as a retail problem, but we need to see it through a wider lens and talk about the town centre as a whole, said Leigh. It’s a question for the whole community and in the end a question of place and identity. The principals of the conference Lena Litens, The Hakon Swenson Foundation, and Andreas Hedlund, The Swedish Retail and Wholesale Council, presented the Award for Best Paper and the Award for Best PhD Paper. Best Paper was awarded to Magnus Söderlund, Eeva-Liisa Oikarinen and Eija-Liisa Heikka for the paper “Humor in the store and its effects on customer satisfaction” and Best PhD Paper was awarded to Karla Marie Batingan Paredes for the paper “Design Thinking for innovation in Retailing: An Exploratory Study”. Last, but not least, the location of the next NRWC in 2018 was revealed and it will be held at Centre for Retail Studies, Bifrost University, Iceland.